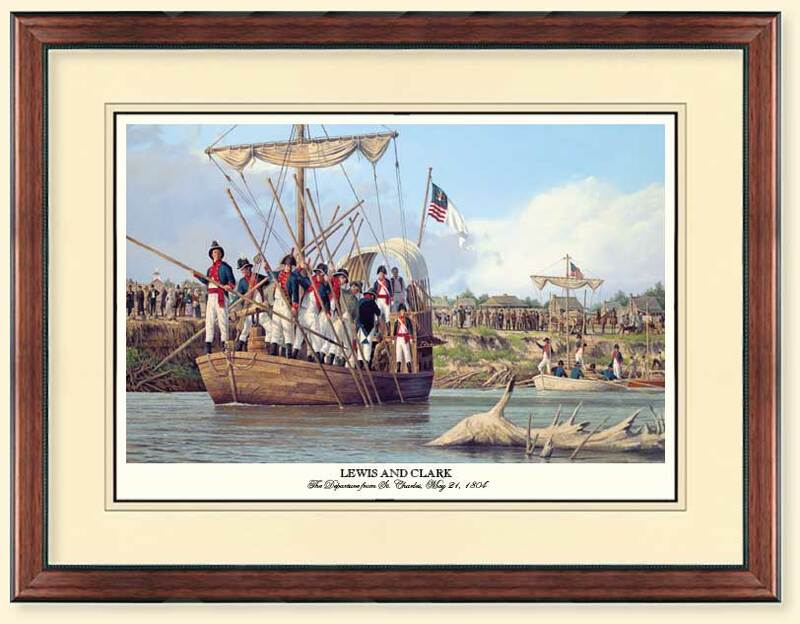 On May 21, 1804, the Lewis and Clark Expedition departed the settlement of St. Charles located on the Missouri River. In my opinion, the exit is part of the formal departure staged by Captain Meriwether Lewis for the citizens of St. Charles and visiting associates from St. Louis. The lists have been checked and rechecked, loads have been adjusted and reloaded, and goodbyes said by all. The men have attended Mass and the crew now feels what must be the true excitement felt by every maritime crew member in history as their vessel pulls away from its moorings and into the current. They are free from the confines of the land and free to wander fulfilling their desire to see around the next bend. The men are under the formal command of Meriwether Lewis and William Clark. Because of the formal nature of this moment and Lewis' desire to impart his will for discipline within the ranks of his men, the viewer of this work sees all hands depicted wearing their best uniform. The expedition will only travel but a mile or so around the first bend and camp for the night. The flags are waving on high only to be matched by the spirits of the men. 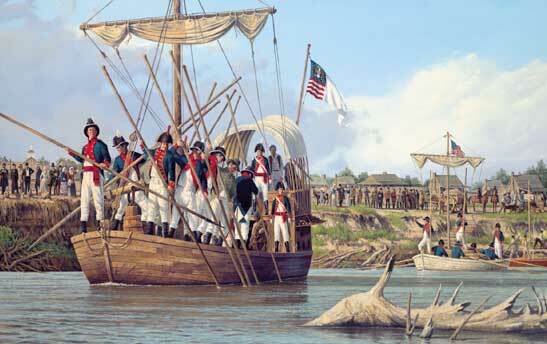 This is the beginning of a true epic journey to open the West of the United States of America, and, to explore the newly acquired land of the Louisiana Purchase, the largest quantity of land in the history of the world to change hands from one country to another without bloodshed. The men are poling and rowing the keelboat and pirogues into history. Thoughts of what lies beyond the horizon only serve to whet the appetite of the adventure hungry members of the Lewis and Clark Expedition.